This anime is pretty old. I first saw it in the 1980s, one of my first anime! I can't believe how long ago that was when it doesn't really feel like it. This was made the year I was born and I saw it when I was about 5 or 6. I loved it. I think it is why I first started to love unicorns actually. I saw this before The Last Unicorn even. I recently re-watched this with my sons. They found some of it to be crazy and really weird and other times I heard them quoting bits and pieces later on. My kids are older than I was when I first saw it, but I think it was a good age to start (10 and 11). As an adult looking back, this is a really scary story! There is this weird ball-like guy who wants to make puppets of all the creatures of the world. Unico just wants to make friends with people, and he is not treated too well by some of them. Then comes a pied piper of sorts who lures them in and makes them puppets for the ball-like guy. 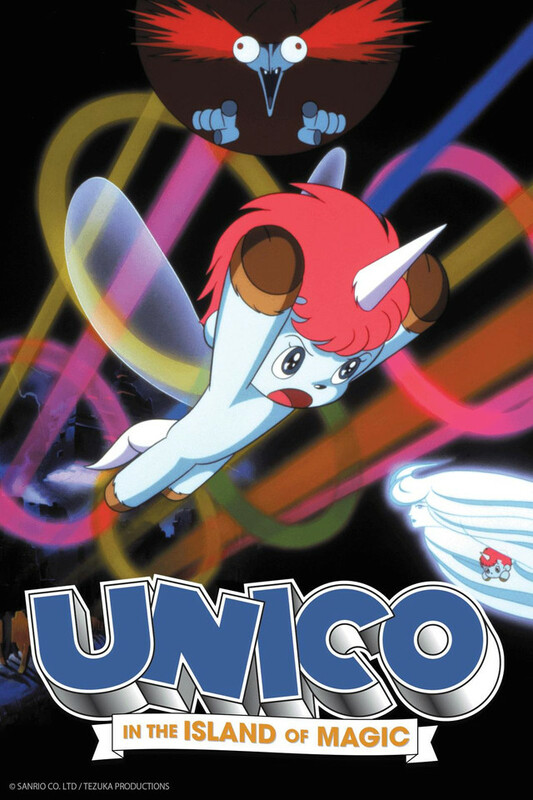 Unico makes a couple friends and wants to bring it to an end. The way he does it is so beautiful and I love the main idea of the story!!!!! What a great lesson to teach kids. This movie is all of the cheese. You could bake a casserole with it. And you know what? It would taste delicious. Ok, but seriously, my review title says it all. This movie came out in the 1980's and its about a unicorn. Naturally, the virtues of kindness and friendship are at the CORE of this movie's theme, and you can expect a cute main character that is adorable in a very shy and softhearted manner.The pacing is excellent. Never during the movie did I feel bored - characters are pretty straight-forward, and there are very few times a scene drags on. Also, the flute theme that plays several times during the movie is supremely enchanting. The animation is pretty solid, and the designs of the characters and environments are well executed. This is animation of the old-fashioned kind. It's artistically exciting enough and cute enough to give kids enjoyment and teach them lessons, and it's full of truth about what it takes to live as a decent human being. Adults enjoy being reminded of that stuff from time to time too—at least this one does.